At the dawn of time, Oj.ompil.e (now called Mount Diablo) was the sacred birthplace of the world. Supernatural beings, the First People, the people before Indian people, lived here. The First People are often designated with the names of animals whose attributes are reflected in their personalities – Condor, Prairie Falcon, Eagle and Coyote. The First People made Indians, providing them with a bountiful, beautiful world, a world which only two centuries ago was much different from the world today. A world din which condors still flew, a reminder of the sacred time. In the late 1700s, it’s estimated that between 280,000 and 340,000 people lived in what is now California. They spoke about 100 distinct languages. 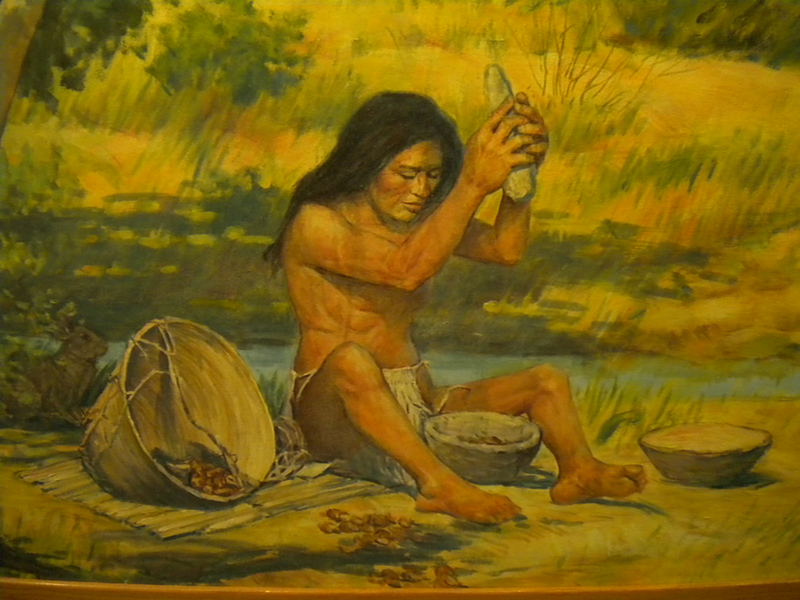 Three such languages were spoken in the East Bay: Bay Miwok, Ohlone/Costanoan and Northern Valley Yokuts. The people were organized into small, independent nations of from one to five towns (villages) including a capital. Six such nations spoke the Bay Miwok language – the Chupcan of present-day Concord, the Julpun of Oakley-Brentwood, the Ompin of Pittsburg, the Saclan of Lafayette, the Tatcan of Danville and the Volvon of upper Marsh Creek. Towns had anywhere from 40 to 160 people. They lived in houses constructed of willow frames, thatched with tule or native bunchgrasses. Many items, such as tools, beads and baskets were an integral part of daily life, and these required precision, patience and technical ability to make. Specialists and professionals often served economic and ritual roles. Hunting and gathering activities required in-depth knowledge of natural cycles. Plant resources were cultivated for optimum harvest with horticultural techniques, such as pruning and burning. At various times, neighboring groups gathered for Big Times, events which featured ceremonial feasting and dancing of several days’ duration. Social bonds were renewed and strengthened, news was shared and goods were traded. Some trade items went through several groups before arriving locally. Obsidian for arrow points came from Napa, while bows appear to have been imported from the Sierra. Disputes were mediated by community leaders, spiritual leaders and family members. Spiritual balance was maintained through complex religious practices. Elegantly designed and carefully constructed featherwork was worn on ceremonial occasions. Dance served as a visible prayer. It was, and throughout California still is, performed to insure the health and well-being of the group. The world changed dramatically after the Spanish began to encroach on the East Bay in 1772. The panic and startled shouting with which the Tatcan living in the San Ramon Valley greeted the Spanish signaled what was to come. The Spanish invasion culminated in the establishment of a mission and presidio (fort) at San Francisco in 1776. While some East Bay people were attracted to the missions, once there they were not allowed to leave without permission of the priests. Many people resisted missionization. The Huchiun (Ohlone from present-day Richmond), Saclan, Volvon and Chupcan were among the groups whose members led the resistance. Their resistance efforts were partly responsible for the decision to locate Mission San Jose so near to Mission Santa Clara in 1797. Diseases of European origin killed large numbers of people at the crowded, unsanitary missions. Spanish military expeditions killed others. Despite the tremendous pressure against it, people continued their cultural traditions after missionization. A multi-ethnic community of former Mission San Jose residents and their descendants existed near Pleasanton into the 1930s. Composed primarily of Ohlone /Costanoan, Plains Miwok, Northern Valley Yokuts, Patwin and Coast Miwok peoples, Alisal (the Pleasanton rancheria) was a center of traditional religious practices. Today, many California Indians have retained their cultural values, traditions and history, while living within the framework of contemporary society. Descendants of the Bay Area’s first peoples are involved in protecting ancestral village and sacred sites, participating in Big Times, creating traditional objects, and interpreting their cultural history to the public. Beverly Ortiz is a staff naturalist with the East Bay Regional Park District. Excerpted and updated with permission from Parkland Discoveries, 1990, a guide to the natural and cultural resources of East Bay Regional Park District. For further information, call 510-635-0135.